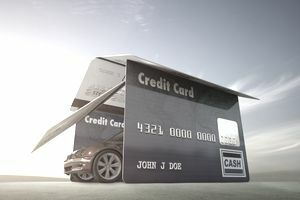 How would you like to have a credit card that gave you rewards that you could use toward a new vehicle? The Toyota Rewards Visa, issued by Comenity Capital Bank, lets you earn points that you can cash in for a new or used Toyota vehicle or for service or repairs. You can also help a family member or friend buy a new car with your points. The Toyota Rewards Visa rewards certain purchases with points that can be used toward service, car parts, eligible purchases, gift cards, statement credit, and even travel. You can earn a 5,000 point bonus if you spend $500 outside of Toyota dealerships in the first 90 days. That's about $167 in purchases each month, which is doable if you just pay a Cash advances and balance transfers don't count towards the spending requirement necessary to earn the bonus. You earn 5 points per dollar at Toyota dealerships; 2 points per dollar on gas, dining, and entertainment purchases; and 1 point per dollar on everything else. Your points never expire and there's no limit to the points you can earn. Points are worth a penny each, so it takes 100 points to equal $1.00. You can maximize your points by always using your credit card each time you take your vehicle to the Toyota dealership for service and repairs. There's no annual fee, which means you can use your credit card for free as long as you pay in full and on time each month and avoid any transactions that incur a fee. The Toyota Rewards Visa offers a 0% introductory rate on purchases for the first 6 months. After that, your interest rate will be 14.24%, 18.24%, or 23.24% based on your creditworthiness. Generally, the better your credit score, the more likely it is that you'll qualify for the lowest rate. The late fee and returned check fee may be as high as $37. You can easily avoid these fees by making your monthly payment on time each month and by confirming that your checking account is open and has sufficient funds to cover your credit card payment. Could You Earn Better Rewards Elsewhere? It can take a long time to earn rewards significant enough to make a difference in a car purchase or even car service. For example, you'd have to spend $2,000 at the Toyota dealership or $5,000 in gas to earn 10,000 points or just $100 in rewards. The gas rewards might be a little easier to earn, but it would be difficult to spend $2,000 at the Toyota dealership unless you know you have major car repairs coming up. A cash rewards credit card, one not tied to a vehicle brand, might be a better option. Cash is more flexible and if you want, you can still use your cash rewards toward vehicle maintenance and maybe even your down payment depending on your redemption options.